either a single one or a pile of three. At three skill points, they can make three kinds of goblets. 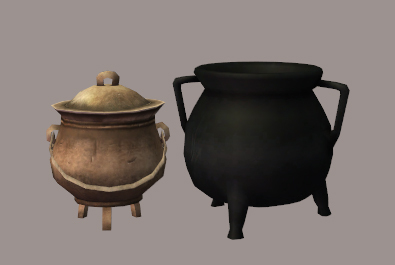 At four, they can make a cooking pot and a cauldron. 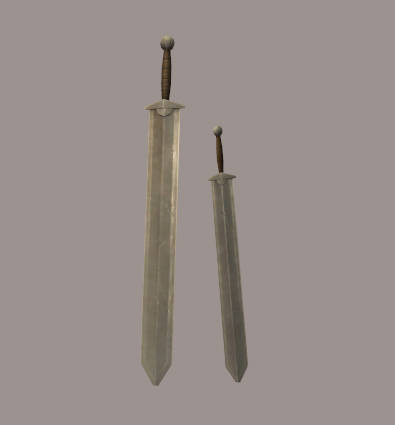 The standing swords require a wall behind, but they can be placed against a wall with a window or something else already on it without using cheats. 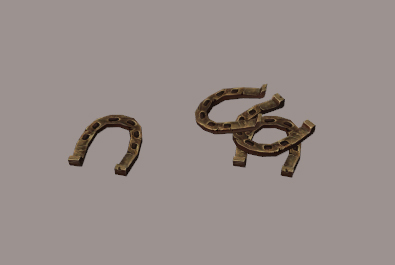 Note that, just as with other crafting items, these will not show up in the catalogue, only in your Sim’s inventory. 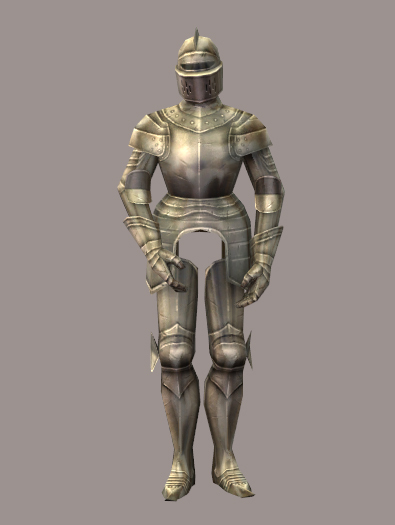 How long it takes the Sim to make the object in question depends on how advanced it is; a horseshoe will be a quick affair, but if your Sim is making a suit of armour, he’ll be at it for a while. You can interrupt the crafting before the object is finished – but your Sim will not be able to resume making the object the next time if you do, they will have to start all over again. Credit is always appreciated – and if you do give credit (you will, right? ), please give it to both me and Rebecah. Without her original object and generous policy, this object – and yours – wouldn’t exist. …again go to Rebecah, who doesn’t just make amazing objects to enrich our games, but who also shares her vast knowledge of things Sim with the rest of us in the simming community with such great generosity and kindness. This entry was posted on 26 July, 2015 at 20:05	and is filed under BUY MODE, Crafting, DOWNLOADS, Hobbies, Medieval-ish, Objects, THEMES. You can follow any responses to this entry through the RSS 2.0 feed. You can skip to the end and leave a response. Pinging is currently not allowed. And yet… She scores again! The crowd goes wild. (insert sound of roaring cheering stadium crowd). Good Work, Johanna. Thank you! Wow. Nice! Thanks for trying so hard to make a custom crafting station. This is beyond amazing! Thanks, Nix. Thank you again! I love both your’s and Rebecah’s stuff. You are both wonderful creators! So it is truly a win-win when something is created for all of us Sims 2 lovers when your great minds are put together into one item! Thank you! Very glad you like it, and my other stuff as well. 😀 I’m nowhere near Rebecah’s league, though, I play in the bottom divisions compared to her. 🙂 I’m so glad she’s still creating for Sims 2! I loved the older version – don’t get me wrong – flying water buckets oh my! 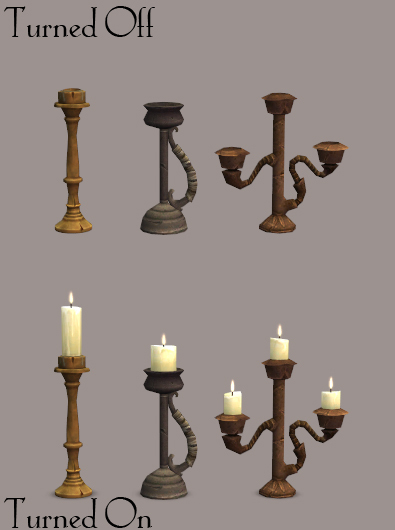 I am so glad you keep creating for the Sims 2. You keep the game ‘alive’. Thank YOU! Nix, just had to tell you how great this is. Being a blacksmith in RL I am impressed with your “realism factor” on this project. Fantastic! I love your stuff. So useful and pretty. Thanks so much for sharing. Finally I have put your workingstation in my downloads …I was too curious,lol. It is absolutely splendid,simple,onetiled and visible in NH.Thanks ! Now,I have a question:What happens if I remove some items(gobelets for example). Will the whole workingstation-file be borked or will the sims be just unable to produce gobelets? Re whether or not deleting crafting items will bork things, it can bork the entire station, it depends on what you do – but then it will only be mild borkage that can be easily fixed in game, so it’s nothing bad or dangerous. 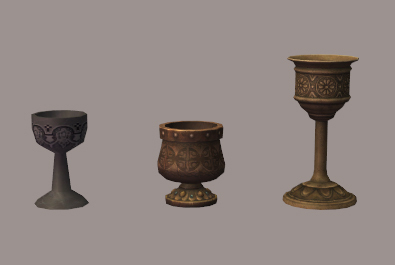 Also, the borkage doesn’t happen until the very end of the crafting sequence, when the item is supposed to be spawned in your Sim’s inventory, so even if you accidentally have your Sim start making a goblet, you’re in the clear as long as you cancel the action before the object is finished. Your work is amazing. Thank you! Thank you so much! I’m so glad you like my humble offerings. ❤ And thank you for commenting, too, comments make my day! The anvil has been updated to fix a problem with the enthusiasm gain. Thanks to DeeDee-Sims @ Tumblr!